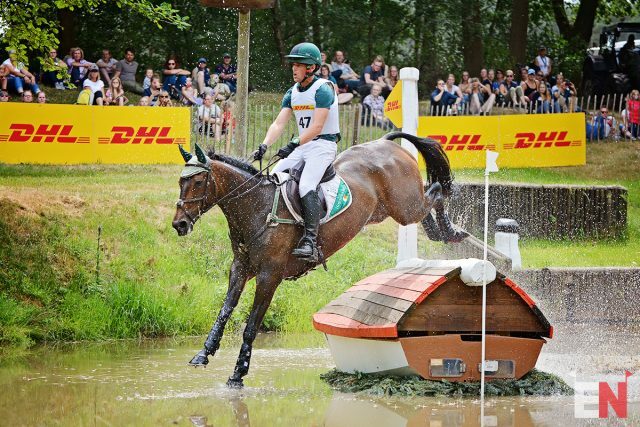 Sam Watson, the founder and product director at EquiRatings and 2018 World Equestrian Games team silver medalist for Ireland, wrote a thought-provoking opinion piece that asks tough questions about the future of eventing. Thank you to EquiRatings for allowing us to share this article on EN. Click here to read more articles from EquiRatings. Go Eventing. Sam Watson and Horseware Ardagh Highlight at Luhmühlen 2018. Photo by Jenni Autry. Leaving the house for a three-day event means saying goodbye to two young boys aged four and five. They ask the question ‘why?’ a lot …! If it concerns vegetable consumption, the question doesn’t get as much air-time, but as two adoring faces look up at me as I carry my last two bags out to the lorry, I pause to entertain their enquiries. The conversation ends when the children have taken the adult to a place where the adult becomes unsure. They are satisfied, whilst I am left pondering the meaning of life, or in this case, eventing. I think the kids are on to something though. Why is eventing what it is? Riders bemoan a lack of prize money. Event organisers bemoan a lack of income. Sponsors bemoan a lack of audience reach. We have the constant balance between safety and spectacular, but what are we actually aiming for? What is the objective of eventing? Eventing is a three phase sport. Cross-country is the only phase that is unique to eventing with dressage and show jumping existing in their own independent forms. What should the balance be between the phases? Should all three be equal – a 1:1:1 ratio? The complete and balanced test of horse and rider. Or should dressage and show jumping be equal, with cross-country holding more importance – a 1:2:1 type ratio? I have heard a ratio in the past which heavily weighted cross-country as the most influential, with dressage then taking more weight than show jumping. Whatever the balance is, I believe that it is vital that this influence ratio is agreed upon and made known to all. Knowing the target influence of the sport would help us to explain it and manage it so much more effectively. We have some judges that use a wide range of marks while others keep the scores tightly bunched. We have cross-country courses that result in one person achieving the best score and we have others that result in over 50% of the competition achieving what is deemed to be the optimum score. Without a clear objective we don’t know what is correct. Can over 50% of competitors achieving a score of zero on cross-country really be accurately describing the optimum level of performance? Surely it is just the average level of performance? We could argue that the sport has gravitated towards one where we compete dressage horses in the cross-country rather than train cross-country horses to perform dressage. Competitively, this makes complete sense. At the WEG in 2018, sixteen horses scored zero on cross-country, but one horse received just short of a four-penalty lead in the dressage. If you want to win in eventing then be exceptional in dressage and be good enough in the jumping phases. As a rider, we keep pushing the boundaries of what is possible. Generally, we have horses with more dressage movement and less stamina and quick footwork. Why? Because cross-country doesn’t matter as much as dressage. This only throws up more questions. The biggest ones we need to discuss more — is this the objective of eventing? Are the objectives of riders aligned with those who must govern the sport nationally and internationally? How Do We Make Cross Country Matter More? What is the purpose of cross country? What are we testing and why? In the old days it was about survival, but those days are gone through no choice of anyone within the sport. The Aintree Grand National changed its fence profile to reduce fallers, it was either that or get shut down. To quote Darwin “adapt or die”. Personally, I see cross country as a skill-based sport. I don’t see why horses need to fall any more than one in fifty starters, or even one in every one hundred starters, even at the highest level. With the use of varied terrain there will be inevitable trips and stumbles, as well as the odd misjudgement, but we can manage the crashing rotational falls better. They are frightening, not exciting. Intensity has become a bad word. As has speed. Stamina is a safety concern. I would test speed and intensity more. I believe that this results in sharp reactions, and high levels of skill which produce excitement. We want horses to think quickly, we want riders to be skilled and we want audiences to be enthralled. I would make a clear distinction between short format and long format eventing. Like cricket (T20 vs Test) or rugby (Sevens vs Test), they are almost different sports. Too often, horses bred for short format that attempt the long format results in fatigue and injury. The short format can work brilliantly; equine stars being seen on a regular basis, show jumping tested to a higher level with fresher legs, and speed and intensity rounding off a crowd-pleasing spectacle. Aachen is a great showcase of the short format. ERM have shown that it can attract a new audience. The short format often results in very few or even no competitors achieving the optimum time on the cross country, so it then becomes more influential as a phase. Short format also has a far lower horse fall rate than long format at each level of the sport. Stamina could be a factor, as could longer galloping stretches with horses being more susceptible to switching off. However, long format events regularly produce extremely high proportions of the field jumping clear and within the time. How do we make long format cross country matter again? What are we trying to test? Accuracy? The knocked-flag rule is not liked by some. Precision? Penalties for frangible activations are not liked by some. I don’t think it is fair to horses to make the fences narrower or more acute. I don’t think it makes sense to build the solid obstacles any higher (although I do think the max heights should be used more). Terrain is definitely a ‘must use’ in order to test footwork and the ability to correctly balance a horse, but beyond that, I believe there is scope for debate about the future of cross country. Skill-based sports should improve. The next generation should be better than the current one. But with so many competitors already achieving the perfect score on cross country, how do we advance the test. Option fences being penalised? Knocked flags being penalised? Knocked fences being penalised? Speeds being increased? We can discuss those tactical changes until the cows come home, but we will get nowhere without a clear understanding of why. Why do we leave the start-box? Why should owners buy horses? Why do we train and compete? Why do fans come to watch or tune in on the livestream? Why should sponsors get behind eventing? What is the perfect eventing performance? Why? Horses with the quality of La Biosthetique Sam FBW are becoming very rare. The three-quarter bred is now the half-bred. Why? What is eventing and what is cross-country? What does the future look like and why are we going there?